The commercial capital of the country, Colombo has added modern touches to its colonial-era core, creating an exciting and eclectic coastal city. 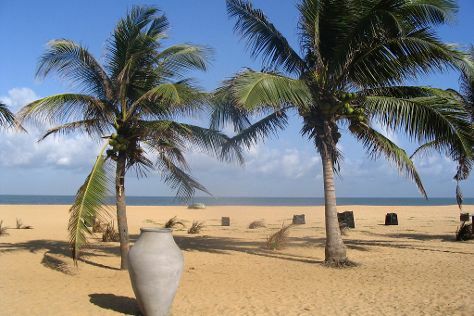 Visit Negombo Beach and Mount Lavinia Beach for some beach relaxation. Get some historical perspective at Gangaramaya (Vihara) Buddhist Temple and St Anthony s Church Kochikade Colombo. Go for a jaunt from Colombo to Negombo to see Nature & Wildlife Tours about 54 minutes away. The adventure continues: see the interesting displays at Colombo National Museum, look for gifts at Salie's Fine Jewelery & Gem Stones, stroll through Galle Face Green, and browse the eclectic array of goods at Pettah. Make your Colombo itinerary with Inspirock to find out what to see and where to go. Indore, India to Colombo is an approximately 9-hour flight. When traveling from Indore in June, plan for slightly colder days and about the same nights in Colombo: temperatures range from 37°C by day to 30°C at night. 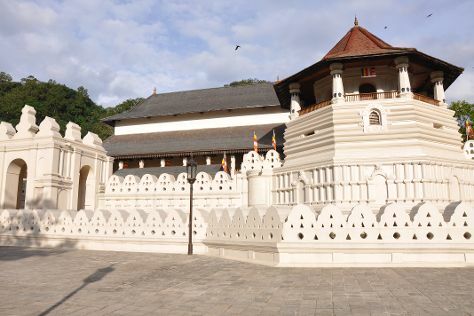 Wrap up your sightseeing on the 10th (Mon) early enough to travel to Kandy. Nestled between mountains in inland Sri Lanka, Kandy proudly bears its World Heritage Site designation while remaining culturally independent and colorfully picturesque. On the 11th (Tue), admire the natural beauty at Royal Botanical Gardens, contemplate the long history of Temple of the Sacred Tooth Relic, then examine the collection at World Buddhist Museum, and finally contemplate the waterfront views at Kandy Lake. For reviews, more things to do, other places to visit, and other tourist information, go to the Kandy travel itinerary planner . You can fly from Colombo to Kandy in an hour. Other options are to do a combination of taxi and train; or drive. On the 12th (Wed), wrap the sightseeing up by early afternoon so you can travel to Mumbai. On the 13th (Thu), take in the spiritual surroundings of Shree Siddhivinayak and then take a memorable drive along Marine Drive. To see where to stay, photos, more things to do, and more tourist information, refer to the Mumbai online road trip planner . Getting from Kandy to Mumbai by flight takes about 11.5 hours. Other options: do a combination of taxi and flight. In June, plan for daily highs up to 38°C, and evening lows to 30°C. Wrap up your sightseeing on the 13th (Thu) to allow time to travel back home. Start off your visit on the 14th (Fri): try to win big at Emperors Palace and then wander the streets of Maboneng Precinct. Get ready for a full day of sightseeing on the next day: steep yourself in history at Mandela House, examine the collection at Apartheid Museum, and then get a sense of history and politics at Constitution Hill. To see photos, maps, and more tourist information, refer to the Johannesburg trip itinerary planner. Traveling by flight from Mumbai to Johannesburg takes 14.5 hours. Alternatively, you can do a combination of train and flight. Due to the time zone difference, you'll gain 3 hours traveling from Mumbai to Johannesburg. In June, Johannesburg is colder than Mumbai - with highs of 22°C and lows of 5°C. Finish up your sightseeing early on the 16th (Sun) so you can travel to Cape Town. Robben Island Museum and District Six Museum are good opportunities to explore the local culture. Let the collections at South African Jewish Museum and Iziko William Fehr Collection at the Castle of Good Hope capture your imagination. There's lots more to do: don't miss a visit to Greenmarket Square, buy something for everyone on your list at Cape Quarter Mall, look for gifts at Prins & Prins, and hike along Platteklip Gorge. For other places to visit, more things to do, and more tourist information, use the Cape Town trip planning site . Traveling by flight from Johannesburg to Cape Town takes 4.5 hours. Alternatively, you can drive; or take a bus. June in Cape Town sees daily highs of 20°C and lows of 9°C at night. Wrap up your sightseeing on the 18th (Tue) to allow time to travel back home.